Light and more. Solutions for all industrial applications. Hardly any other sector provides as many activities and spatial situations as the industry. However, one aspect unites all activities: The human being, his or her well-being and work performance. These points depend crucially on one factor: the success factor light. And at competitive prices and operating costs. 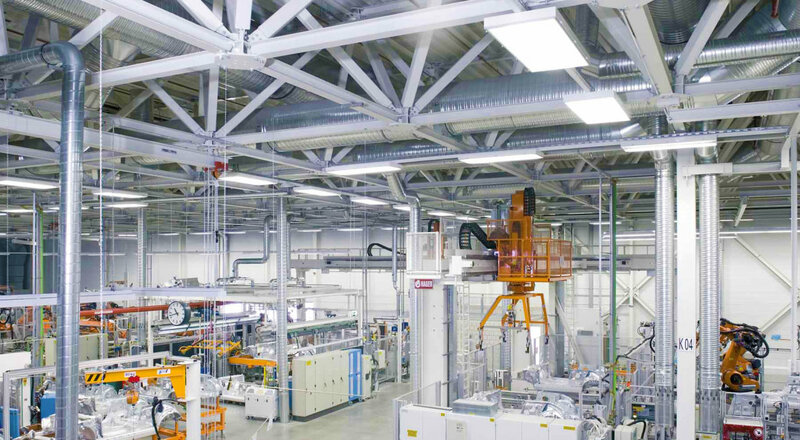 With its industrial portfolio, OSRAM provides industrial customers with solutions that go beyond light with light and technology. From individual luminaires to turnkey lighting solutions – including light management systems, services, financing, and more. People spend 90 % of their time in buildings, often with artificial lighting. 80 % of all information we perceive is through our eyes. Up to 70 % of the electrical energy costs in a logistics hall can be attributed to light. Motivation as a success factor. Increased lighting intensity means people can work in a more concentrated way, tire less quickly, make fewer errors, and detect errors more precisely. And what makes life more pleasant for the individual, is more lucrative overall for the company. That’s because, when extrapolated to the entire workforce, the enhanced motivation through light becomes a valuable asset and competitive advantage. The objective of Human Centric Lighting (HCL) design concepts lies precisely in this significant improvement in the lighting situation for enhanced well-being and productivity at the workplace as well as optimized synchronization with the outdoor environment. The right angle is critical, HCL design approach. Safety as a success factor. Work reliably without dark sides. The topic of work safety remains a challenge for the entire industry – the overall number of work-related accidents even increased again slightly in 2016. Lighting offers enormous potential to increase safety, with the warehouse and logistics areas offering the best examples of this. The functional safety of the lighting “hardware” itself is one key aspect in this regard: industrial lighting solutions are characterized by reliable functionality and an especially long life. They have to withstand demanding conditions such as mechanical load, high / low ambient temperatures, dust and humidity, as well as chemical exposure. Another aspect in this regard is safety lighting, which comes into effect following a power failure. Optimum light is a guarantee of safety. Spatial conditions can often be confined in the warehouse and logistics sector in particular, owing to narrow traffic areas and high shelves. Uniform illumination, high vertical lighting intensity, and good glare reduction are therefore important factors for ensuring good detection. Profitability as a success factor. Refurbishment options on a grand scale. LED technology improves energy efficiency considerably in large-scale car parks and parking zones with many lighting points. This means shorter pay-back periods and significantly lower ongoing operating costs. And: its use also increases the lighting quality – higher vertical and cylindrical lighting intensity means better detection. In terms of overall costs in general then, a refurbishment project with LED luminaires often pays off after just two to three years – not to mention additional benefits such as enhanced safety and optimized maintenance. Profitability can be increased even further using sensor-based systems. They create additional potential to save energy since the lighting is only activated when needed – when people are in the car park and cars are moving. Networking as a success factor. Smart controls for enhanced efficiency. Alongside daylight usage, sensor technology is gaining ever-increasing importance. Yet this technology alone will not exploit the potential energy savings. An efficient overall system can only be achieved through a combination of high-quality sensors and professional control technology together with specifically designed luminaires. Individual utilisation with simple operation: efficient light management is the basis for low operating costs and simultaneously high quality of light. System components that build successively on one another furthermore allow uncomplicated assembly without significant programming being required. The new backbone of the smart factory is emerging. A light management system encompasses lighting control, efficient energy management, and networking of all relevant objects: control elements, control units, daylight and motion sensors as well as electronic ballasts in the LED luminaires. The result is optimized operating costs and real-time monitoring of the system status. OSRAM and its partners offer a variety of smart light management systems to meet your individual needs. Solutions have already been developed in collaboration with partners in the area of the smart factory – for example such as digital data management, predictive maintenance, cloud integration, and much more. In a production environment, it is crucial to provide the right level of light for every job to ensure safe, error-free worker performance. Energy-efficient, compliant lighting solutions by OSRAM make sure no detail goes unnoticed. Operating fork trucks and searching for items in narrow, tall storage aisles is difficult. Smart, sensor-controlled industrial light management systems switch the lights on when and where they are needed, saving energy and costs. A well-lit workplace is an essential prerequisite for correct execution of the given task. Workplace-specific, bio-active, glare-free illumination solutions by OSRAM meet and exceed applicable standards for work spaces while conserving energy. Good lighting is needed in many other areas of a business site. Good lighting is needed in many other areas of a business site. OSRAM makes sure pleasant, top-quality light is available at every location where humans work, from utility rooms to control stations, and from car parks to facades and hotels. 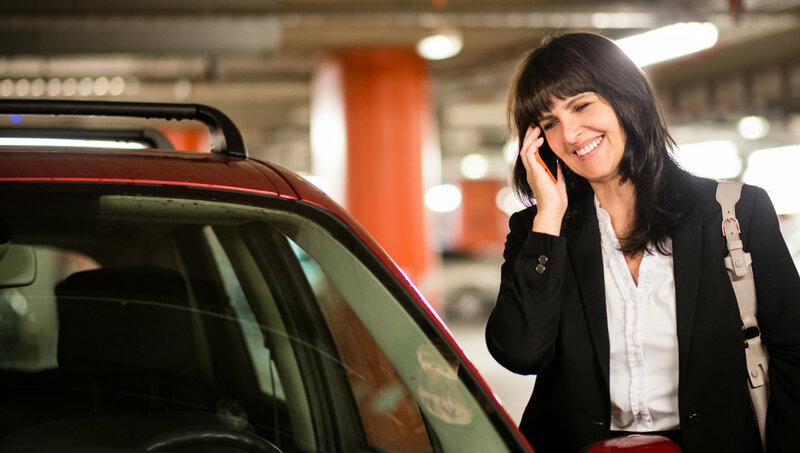 Whether multi-storey car parks, company parking facilities, shopping centres, office complexes, concert halls, sports arenas, railway stations or airports – parking garages and parking lots unburden the infrastructure, shorten routes and create space, as well as making our professional and leisure lives a lot more simple. In our industrial product portfolio you can find luminaires for every scope. Discover our highbay and damp-proof luminaires as well as trunking systems for flexible and efficient industrial lighting. How may we support your project? As a full solutions provider we support you with a comprehensive range of services. From product development, consulting and planning to programming, installation and maintenance.